For the visible reduction of redness & calming of sensitivity and soothing flushing/blushing. A non greasy light cream. 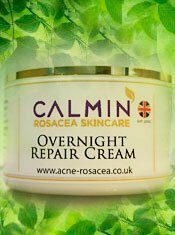 Repair over night with natural plant extracts. Aqua, cetearyl alcohol, polysorbate 60, vegetable glycerin, sunflower seed oil (helianthus annuus), olive oil (olea europaea), coconut oil (cocos nucifera), shea butter (butyrospermum parkii), apricot kernel oil (prunus armeniaca), zinc oxide, oat silk (avena sativa), vitamin E (tocopherol), vitamin C (sodium ascorbyl phosphate), hyaluronic acid (sodium hyaluronate), stearic acid, xanthan gum, avocado oil (persea gratissima), wheat germ oil (triticum vulgare), evening primrose oil (oenothera biennis), argan oil (argania spinosa), green tea extract (camellia sinensis leaf), passionfruit extract (passiflora edulcis), arnica oil (arnica montana), plum extract (prunus domestica), phenoxyethanol, ethylhexylglycerin.